Charles Morice Pole was born in England on January 18, 1757, and entered the Royal Academy in 1770. 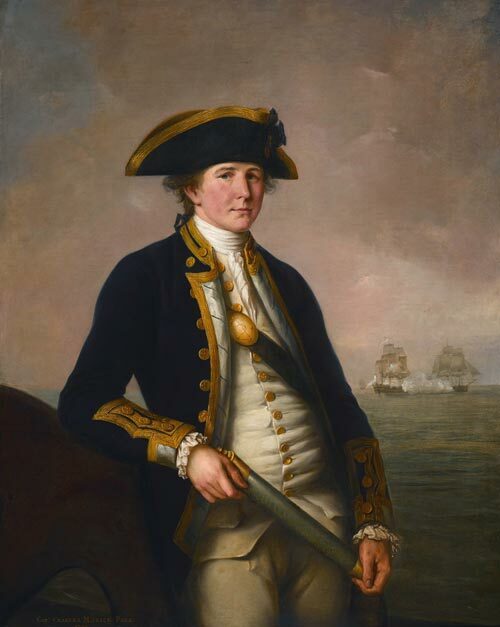 He served in the East Indies, and was promoted to lieutenant on the Seahorse in 1777. He participated in the siege of Pondicherry (India) and after returning to England was promoted to post-rank in 1780. In 1788 he acted as Groom of the Bedchamber to the Duke of Clarence, and was present at the occupation of Toulon in 1793. Pole was promoted rear-admiral in 1795 and served in the West Indies. He was promoted captain of the fleet in 1797. On June 3, 1800, Pole was appointed governor and commander-in-chief of Newfoundland. Immediately, he addressed the outbreak of smallpox in several communities. Accompanying doctors John Clinch and John McCurdy, inoculation was practiced in Ferryland, Placentia and St. John's. Furthermore, Pole continued to support Waldegrave's charity "Committee for the Relief of the Poor". His term ended in 1801. After his term as governor, he was in command of a fleet in the Baltic, and was created a baronet that September. In 1802 he was a member of Parliament for Newark, and was promoted to admiral in 1805 but had no further active service. On July 22, 1830 he became Admiral of the Fleet, and died that year at Denham Abbey, Hertfordshire on September 6th.